I began my path as an arborist 18 years ago and my life as a runner 2 years ago and I have learned the value of both. Running and Trees may seem like two different animals but their are lessons to be learned from both. Trees are interwoven throughout our daily lives and we rarely notice them until they are gone. Our bodies are similar. Time means change. Mature trees will stop growing taller and will instead grow thicker. Their canopies will begin to thin and the risk of breaking limbs becomes greater. Sound familiar? It probably does to anyone over the age of 50 with a growing waistline, thinning hair, and unsteady legs. Fortunately it’s not all bad news. Mature trees are irreplaceable and more beneficial than a young tree. Time will bring similar changes to us. Although our potential for fast growth has declined, the wisdom we have gained more than make up for the change. I will never be as fast or strong as I was when I was 20 but I am still able to increase my potential by learning patience and endurance. This year, let’s all try to look to the future. Prune and treat your trees now. Don’t wait until the tree is unhealthy or about to split apart in a storm. Exercise now. Don’t wait until you are older or at risk of diabetes. Too often we make the mistake of neglecting our health until it’s too late. We also tend to neglect our trees until it’s too late. Once the damage is done, it’s much harder to fix. Let’s take care of our environment whether it be the earth or our bodies. Don’t take these things for granted, practice thankfulness, mindfulness, happiness, and healthiness. Why to Prune Your Trees in the Winter? One question people are always asking me is; “ is winter pruning a good idea?” or “when is the best time to prune a tree?” Although many people like to wait until the summer months to have their trees pruned, studies have shown that late winter and early spring are actually a better time to prune. Beginning in the fall and continuing into winter, trees shift to a dormant state. The trees growth (including wound closure) slows significantly and does not begin again until the following spring. Optimum wound closure is achieved by pruning during the late winter and early spring, right before the flush growth of spring. The wound left by pruning is able to begin closing as soon as the weather warms and is given the maximum amount of time to heal. Other reasons for winter pruning include disease control and storm preparation. Insects and fungal infections begin as the weather warms and are problems which may be aggravated by pruning at the wrong time. A certified arborist will be able to identify these issues and take the appropriate steps before they become a problem. Be proactive by pruning your tree ahead of time before costly and unsightly damage occurs. Don’t forget about your trees this winter. Winter pruning has proven benefits and your investment in trees will pay dividends for years to come! When dealing with tree companies it is advised that the customer request to see documentation of worker’s compensation status and liability coverage. The purpose of the liability coverage is to cover your property against accidental damages from tree work being completed. If the tree company does not have coverage then the next option is your homeowners insurance. You, the customer, would have to contact your agent to find out if they would cover any damage to your property caused by the tree company. I would be cautious of accepting anyone’s verbal statement of coverage. 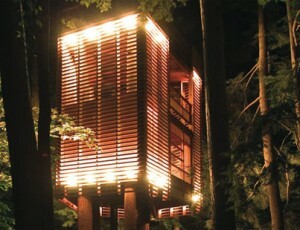 Found Lukasz Kos’ 4TREEHOUSE online the other day. Wow! The three level structure has a bit of a Japanese feel ot it…when it’s illuminated it reminds me of Close Encounters of a Third Kind. Haven’t really seen a treehouse like this in Columbus…we’ll keep this in the “future corporate headquarters” file.